SyFy's insanely popular Sharknado series will officially ending with Sharknado 6, which just got the official title of The Last Sharknado: It's About Time. In addition to the title, SyFy also released a brief teaser trailer to get fans excited for the late summer release date. SyFy is going to celebrate the release of the sixth and final movie in the series with an entire week of shark themed programming during what they've titled Sharknado week, which is coming a few weeks after the official Shark Week, so it's like getting two Shark Weeks. Sharknado 6 will premiere at the end of the Sharknado week on Sunday, August 19th. 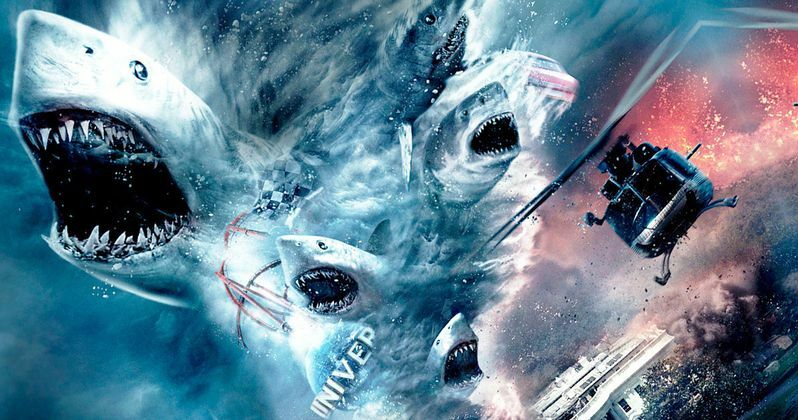 Things looked pretty bleak at the end of Sharknado 5: Global Swarming, with Ian Ziering's Fin character alone after the Earth had been destroyed. In Sharknado 6, Fin must go back in time to stop the original Sharknado and save the world. One has to wonder if the Avengers 4 screenwriters knew about this plot before writing the upcoming Marvel movie. The official synopsis reads. "All is lost, or is it? Fin unlocks the time-traveling power of the Sharknados in order to save the world and resurrect his family. In his quest, Fin fights Nazis, dinosaurs, knights, and even takes a ride on Noah's Ark. This time, it's not how to stop the Sharknados, it's when." The brief teaser trailer for Sharknado 6 obviously doesn't show much, but it promises carnage across history. Fin is going to fight Nazis, which leads one to believe that a shark could maybe prevent the Holocaust from happening by eating Hitler. Hopefully they learn from Deadpool 2 and make sure it's the adult Hitler instead of the baby version of the dictator. Elsewhere, Fin is going fight dinosaurs, knights, and catch a ride on Noah's Ark. Basically, Sharknado 6 is going to have a lot of everything. In addition to Ian Ziering, Sharknado 6 will also star Tera Reid and Vivica A. Fox along with a whole bunch of celebrity cameos that are being kept under wraps for the time being. Famous weatherman Al Roker, Benji Bronk from the Howard Stern Show, Corey Taylor from Slipknot, and a ton of other celebrities from all walks of life have had small roles in each of the past five Sharknado movies. Since Sharknado will reportedly be the last, expect quite a bit of star power behind this one. Sharknado 6 will premiere August 19th on the SyFy Network, so there's still plenty of time to catch up and re-watch the first five Sharknado installments before the end comes. And while the wait seems long now, a full-length trailer is expected to be released in the coming weeks to truly get the hype pumping for Sharknado 6. It looks like the final movie will be the most absurd out of all of the previous installments, which is saying a lot. You can check out the first teaser trailer below, via the SyFy Network YouTube channel. Fin’s not gonna let a little thing like linear time stop him.